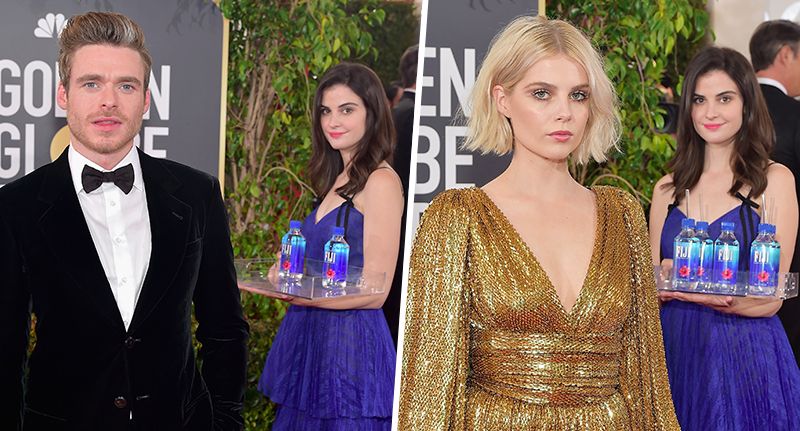 You may have noticed a woman carrying a tray of Fiji Water on the red carpet, and surreptitiously photobombing Hollywood’s great and allegedly good, at the 76th annual Golden Globe Awards. But now the model, whose real name is Kelly Steinbach, is suing Fiji Water, alleging they created an unauthorised marketing campaign based off the viral sensation she fronted. Much like the so-called Corona Girls at the Mayweather v McGregor fight way back when – in 2017 – companies have long paid models to promote their products at events cluttered with photographers and paparazzi. But, seemingly oblivious to this little quirk of capitalism, or perhaps revelling in the obliques idiocy of it, the Internet Jury takes great pleasure in pointing out the so-called photo-bombers and making memes of them. Well, the same happened to Steinbach. More than 50,000 people tweeted about her special appearance. A month later, and Fiji Water used her now-viral image at the Screen Actors Guild (SAG) Awards last weekend – of a fashion. The company commissioned some cardboard cut outs of Steinbach and strategically placed them on the red carpet to monopolise on the viral Twitter moment a month prior – as Hollywood are want to do, with the recent wave of nostalgic remakes. Steinbach is now suing Fiji Water and its parent company, The Wonderful Company, for allegedly creating a marketing campaign around her viral moment without permission, requesting the company to stop using the cutouts and pay her for damages. Despite last minute negotiations with the 31-year-old model’s agent, Fiji Water allegedly went ahead with the cutouts against her wishes. In documents filed to the courts, and obtained by The Blast, Steinbach’s lawyers allege Fiji Water have capitalised off her image likeness and had offered, ‘gifts to entice’ her to give permission while pressuring her ‘into video recording a fake signing of a fake document to simulate… signing on as a Fiji Water Ambassador’. On January 8, Fiji Water attempted to negotiate an agreement with Steinbach’s agent, but it was too late as a cardboard cutout of the model was already standing outside of Bristol Farms in West Hollywood, the documents read. She is now demanding a payout but Fiji Water has refuted Steinbach’s claims and stated the lawsuit is ‘frivolous and entirely without merit’. In a statement to People, the company said that they had ‘negotiated a generous agreement [which] she blatantly violated’. This lawsuit is frivolous and entirely without merit. After the Golden Globes social media moment, we negotiated a generous agreement with Ms. Cuthbert that she blatantly violated. We are confident that we will prevail in Court. Throughout our history, we have had a sterling reputation working with talent. I guess she’s serving up hot water for the company, now.